The Finance Ministry published a Job circular 2019. In order to assist the government lawyer in the finance departments, a private lawyer panel will be appointed by the Supreme Court’s Appellate Division and three for the High Court Division, one for the administrative tribunal and the administrative appeals tribunal and one for the subordinate court along with the Civil Court. * The applicant’s lawyer will be permanently residing in Dhaka. * For conducting a case in the Supreme Court and the Administrative Tribunal, there must be at least 10 years of experience as a lawyer in the High Court Division and Appellate Division. To conduct a lawsuit in civil court, there must be at least 10 years of experience as a lawyer in civil court. * The applicant’s age cannot be more than 60 years. * Retired district judges/judges can also apply. 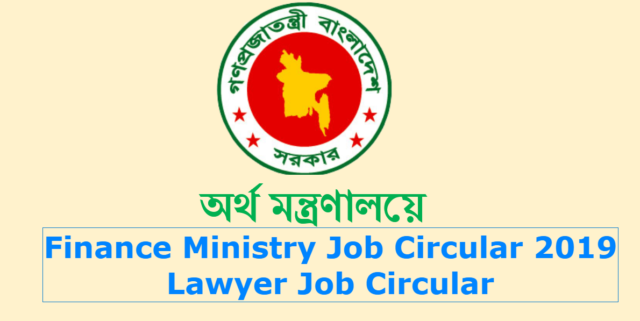 According to the rules given in the notification, the application will be submitted to the joint secretary (administration), finance department, the ministry of finance (Room No-224, Building No-07), Bangladesh Secretariat, Dhaka (Member Secretary, Appointment of Panel of Panchayat Panel) on February 26.